The next morning when we awoke and were deciding what we were going to do that day, I decided to go for a tromp through the old cemetery in the swamp behind the house while breakfast was being made. The morning dew was still on everything so my legs got pretty wet pretty quickly. Before I left, Rutabaga warned me to watch my footing because many of the graves were so old that the wooden coffins had caved in, forming holes in which to twist one’s ankle, that were obscured by underbrush. Hmm…creepy. But it was a glorious Yoopee morning, the best kind, and I was feeling exceedingly lusty and ready to tackle the day. So basically at the end of Rutabaga's backyard is this wall of wetland foliage, and in it are old lost tombstones dating back to at least 1865. And a half trillion mosquitoes. This is the old Schoolcraft Cemetery, sometimes called the Centennial Cemetery. All I could think about was how this was like that Mt. Moriah Cemetery in Philadelphia. Schoolcraft Cemetery was started in 1865, which predates the founding of the Centennial Mine by 11 years, but coincides with the return of soldiers from the Civil War. Back then, if a Yooper was drafted, he probably reported to Fort Wilkins in Copper Harbor where he most likely got on a boat for Detroit. There, he would be sent to Fort Wayne where he would receive his uniforms, his training, his musket, and orders to march to the South. Michigan sent over 90,000 men to fight in the Civil War, when it was thought in Washington that very few men would show to volunteer from that remote wilderness state. 1,209 came from the Upper Peninsula. 14,753 of those Michigan men never returned to home soil. Many of those men are buried in the ground at the Battlefield of Gettysburg. The 24th Michigan, part of the infamous “Iron Brigade,” is celebrated as having held the Union lines during that fateful engagement, while enduring an 80% casualty rate in that battle. Over the course of the entire war, the Iron Brigade suffered the highest casualty rate of any unit in the Union Army. Not only that, but while defending McPherson’s Ridge they also inflicted the highest casualty rate of any engagement at Gettysburg, against the 26th North Carolina—despite being outnumbered almost two to one. The Michigan Cavalry Brigade, commanded by General Custer and infamously known by his battle cry, “Come on, you Wolverines!” fought in every major campaign from Gettysburg to the end of the war. They helped repulse Pickett’s Charge, and later captured General Lee during his escape from Sayler’s Creek, precipitating his surrender at Appomattox, ending the war. The 19th and 23rd Michigan Infantries took part in “Sherman’s March,” which bored a trail of destruction straight through Georgia. One soldier from Marquette wrote, "It seems the rebels have got a prety (sic) good opinion of our fighting propensities, for when they retreated through Strausburg they told the inhabitants that the Yankees were coming and the Michigan devils were leading them." The Mining Journal records that of the 265 men sent from Marquette, only one of the dead was ever confirmed to have been returned to home soil. From the three counties that make up the Copper Country, 850 men were sent to fight. A war memorial in Houghton lists the names of 73 men from that city who never returned. Though comparatively few men were drafted into service from the Yoopee, this may have been due to the fact that they were needed more on the homefront in their capacities as miners of the recently discovered copper and iron deposits that were crucial to supplying the Federal Army. Without that supply line, the Union would surely have lost. Supposedly some maintenance work had been done here, but whoever has been in charge of that has been slacking lately. I think Rutabaga said they only do cleanups once a year or something. She also said that she had found several stones with the same last name as her family, and was pretty sure she was probably related to some of them. I did stumble a couple times when I suddenly stepped down into someone’s collapsed grave. The old pine boxes they buried poor miners in back then eventually cave in from the weight of the earth above, forming an oblong depression in the ground several inches deep. It’s kind of creepy, actually. Especially when you can’t see them in the underbrush and suddenly feel yourself falling into one. I have also heard that this cemetery was where some of the victims of the Italian Hall Disaster were buried in 1913...exactly 100 years ago. Anyway, when I was done and my pants were sufficiently soaked-through with dew, Rutabaga summoned me back to the house when we were ready to leave on our day’s adventure. We were going to make a run at Hungarian Gorge down by Tamarack City. I had known of beautiful Hungarian Gorge and its many waterfalls and ruined bridge spans for many years, but never seemed quite able to check it off my list. Today, finally, I would learn just what I had been missing all this time. The gorge gets its name from the fact that the Hungarian River carves it out on its way to Torch Lake, and the river gets its name from the old Hungarian Mine. 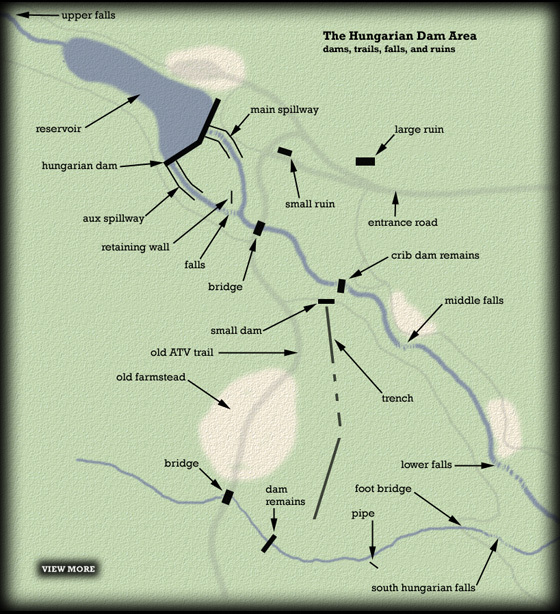 But what’s so Hungarian about the mine, I don’t know. 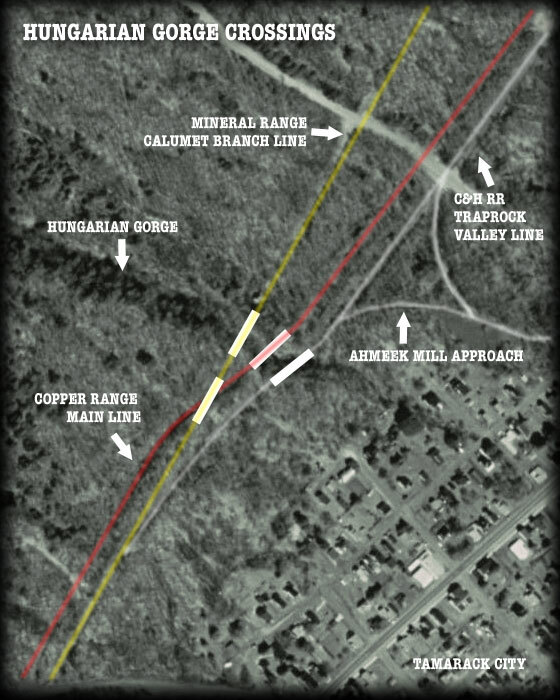 They are actually the foundations of the Mineral Range RR viaduct as it crosses over the Copper Range line before reaching the gorge. Looking down the nearly vertical chute, I had to wonder how big this minuscule trickle might get during spring runoff. By this point we had been out on the trail for about an hour, and it was abundantly clear that we had grossly underestimated the amount of time necessary to properly take in Hungarian Gorge. We were not even halfway to the dam, and it was already time to head back to the house for a bbq.